The Book of Judges begins its narrative making it evident that the occupation of Canaan is still not complete. Initially, the fight was a straightforward success for the Hebrews and an excellent start to a challenging era up ahead. 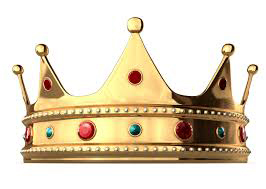 The beginning of the period of the Judges proper (Othaniel being the first Judge) takes place in Judges 3 1 Judges 1-2 is a period where the Army of God, becomes complacent in victory and fails to occupy Canaan that they were given wholly. God gave this Promised Land to the people of Israel. The failure in thoroughly taking over Canaan is rooted in the people’s disobedience. Instead, the Israelites settled on the secondary strategy of consolidating their various positions and fortifying their new borders. In history, human and natural, there is always a dual explanation for things: in the earthly realm and the spirit realm. 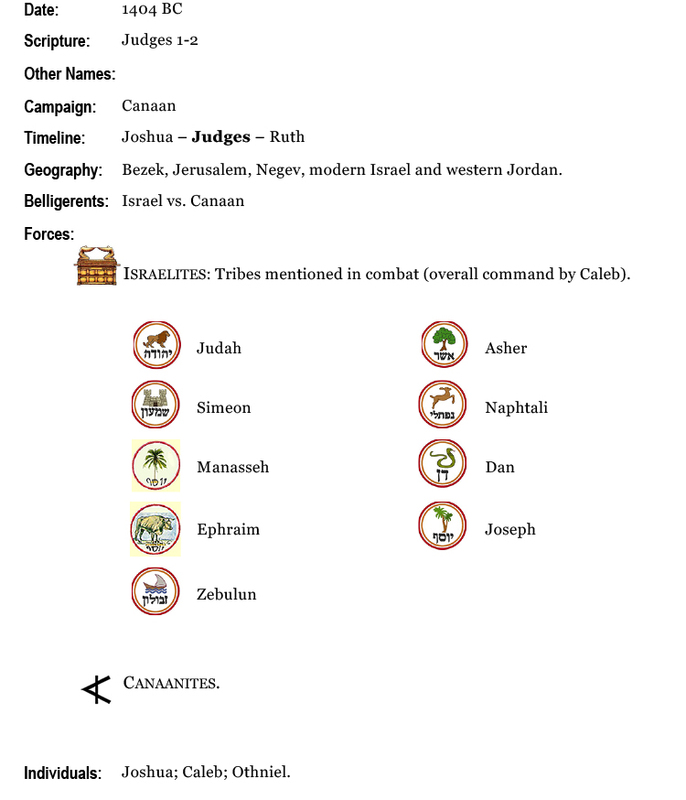 The conquest of Canaan was no exception. On the one hand, it was the geographic disposition of Canaan (hills, rivers, mountains) that stood in the way of a seamless occupation. On the other, the spiritual cause for the delay in taking Promised Land that was already theirs was due to the first disobedience after the exodus and recurring worshiping of other gods which the people chose to entertain. This practice often led to periodic rebellions throughout Judges and Kings as we will see. This is why Israel, although still a young nation, nevertheless struggled against much weaker peoples. The fact that there is little historical record of peoples like the Moabites, Midianites, and Amalekites shows their low importance in the greater scope of the Levant. In fact, Israel, to this day, has tried many times to occupy the whole of the Promised Land but never succeeded entirely. It was very close at different times in history, but it never took it over entirely as God had intended. This failure was because of taking sin into the Promised Land. That is why episodes such as that of Achan before the Battle of Ai was so significant. It was a matter of full commitment to God. God needs a pure heart from His followers. Holding the ground is not enough in the long run. 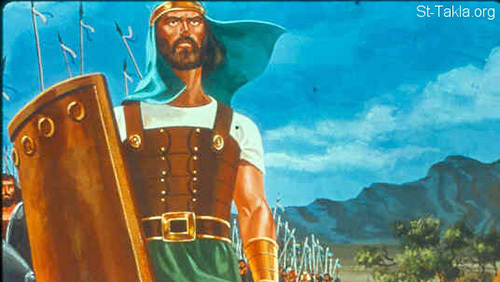 The Israelites should have taken full advantage of the Canaanite defeats in the previous campaigns of Joshua. God had planned for them to advance and take all of the Promised Land. The Hebrews thought they could hold on to what they had but, in adopting that lesser strategy, they risked losing their ground. 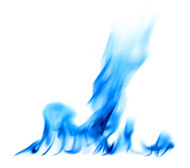 In war, more often than not, if you are holding your ground, you are in disadvantage. You must continuously advance and take new territory in the Promised Land. 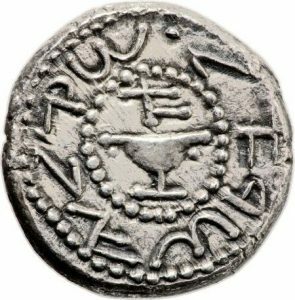 The Battle of Bezek was the first victory in a series of gains. However, as the campaign proceeds we see that each new enemy city taken becomes harder, and soon, the Israelites are faced with a war of attrition, as the victories become ties and some outright failures. Judah attacked and defeated an army of ten thousand Canaanites and Perizzites at Bezek. They made an example of their commander, Adoni-Bezek, by cutting off his thumbs and big toes. 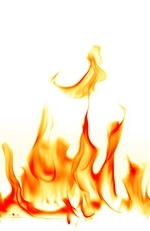 Judah proceeded to take Jerusalem (before it was called that), kill the inhabitants and set fire to it. Judah turned to attack the Canaanites in the surrounding hills, Negev and the western foothills to eliminate the Canaanites there. Judah advanced against the Canaanites in Hebron Defeating Sheshai, Ahiman and Talmai. 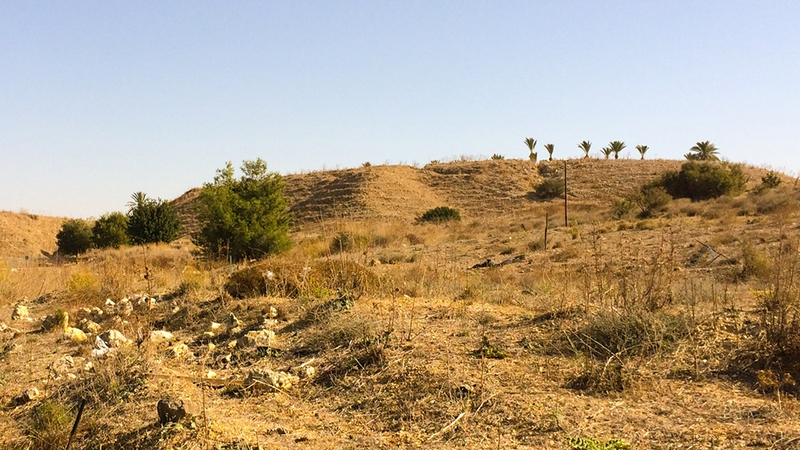 The attack to take the region of Gaza, Ashkelon, and Ekron was beaten back but succeeded in taking the hill country. The Army of God could not expel the Canaanites on the plain due to their tactical edge in iron chariots. 8. The half tribe of Manasseh failed to capture the cities of Beth Shan, Taanach, Dor, Ibleam, and Megiddo because of superb Canaanite entrenchment. 9. 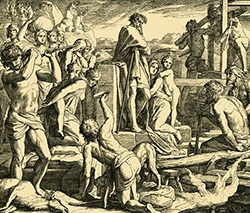 The half tribe of Ephraim captured Gezer but the Canaanites, willing to endure any hardship, remained in the Promised Land and cohabited with the Israelites. 10. Zebulun captured Kitron (Kishon River) or Nahalol but also kept the Canaanites for forced labour instead of driving them out. 11. 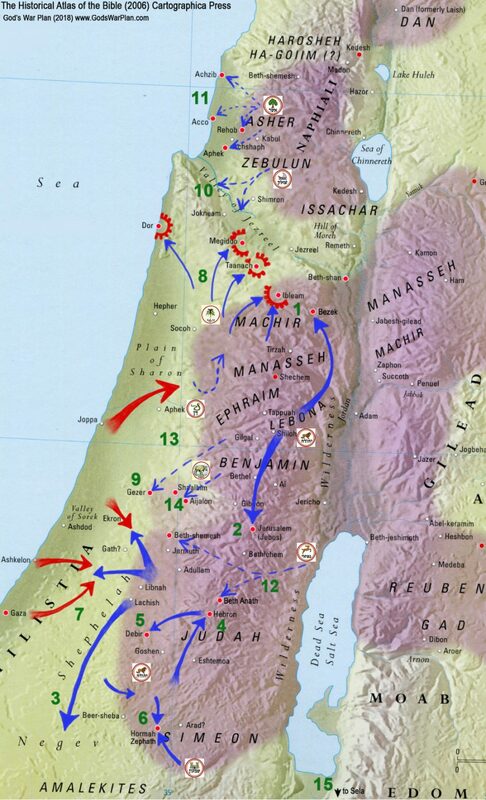 Asher captured Acco, Sidon, Ahlab, Achzib, Helbah, Aphek, and Rehob but also decided to allow the Canaanites to stay. 12. 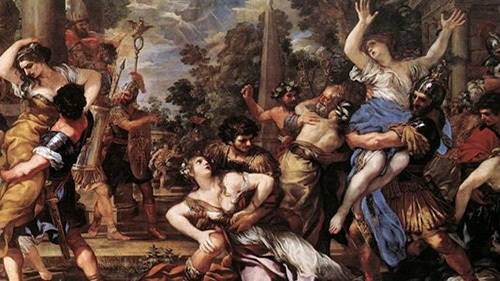 Naphtali captured Beth Shemesh and Beth Anath and put their Canaanites to forced labour. 13. 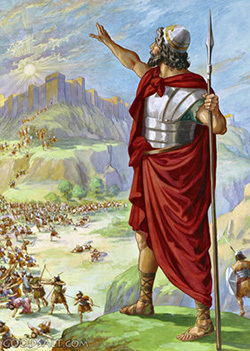 The Amorites counterattacked, gaining control of the plains and pushing the people of Dan into high ground. 14. 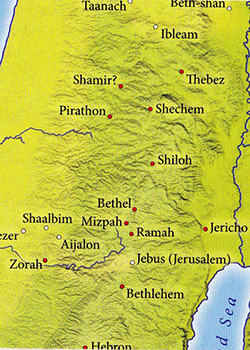 Mount Heres, Aijalon, and Shaalbim were Amorite strongholds for a while until the House of Joseph (Manasseh and Ephraim) subdued them also putting the inhabitants to forced labour. It is interesting to note that while in warfare of the post-industrial revolution the high ground is the most prized area for controlling the battlefield with the use of artillery and other weapons, here, in antiquity, the plain is vital for its food water and other resources necessary. In what was becoming a set pattern, while the Army of God was victorious in the hill areas, their military success came to naught on the plains. 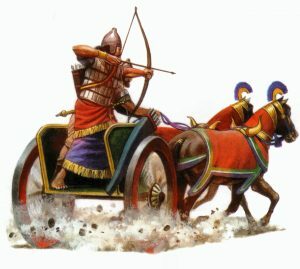 This happened for the same reason as ever: Canaanite iron chariots. Not being able to take the finals against this lethal foe, the Israelite advance was halted in most places. 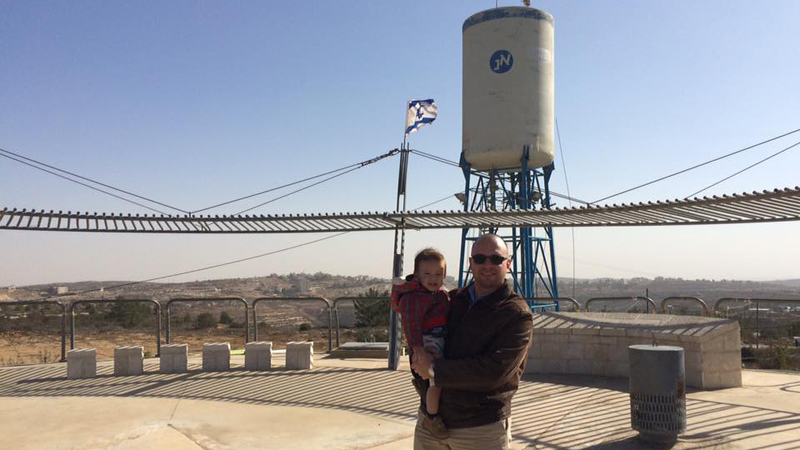 Judah: failed to capture Gaza, Ashkelon, and Ekron. Caleb (commanding Judah) took Hebron and drove out the three sons of Anak. Benjamin had Jerusalem but did not expel the Jebusites; instead they intermingled. Manasseh reached Beth Shan, Taanach, Dor, Ibleam, and Megiddo but was unable to drive out the occupants. 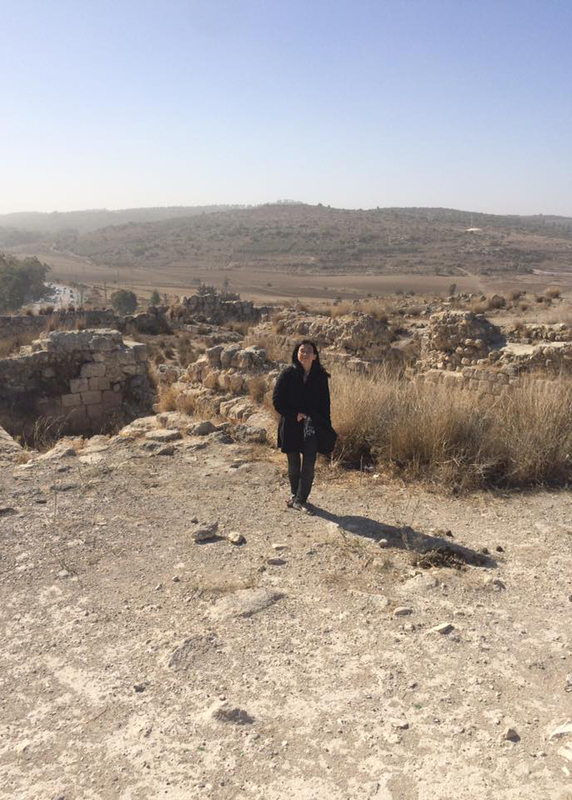 Ephraim arrived at Gezer but also left its people in. Zebulun acquired Kitron and Nahalol and left the Canaanites there. Asher did the same with the people of Acco, Sidon, Ahlab, Aczib, Helbah, Aphek, and Rehob. Naphtali occupied Beth Shemesh and Beth Anath and lived with their citizens. Dan’s case was even harder. The Amorites there counterattacked and the Israelites retreated back up the high ground where they had the defensive advantage. Joseph, captured Bethel with the help of a spy on the inside ; in another area, after hard fighting in that lasted longer than the others, was able to take Mount Heres, Aijalon, and Shaalbim from the Amorites. 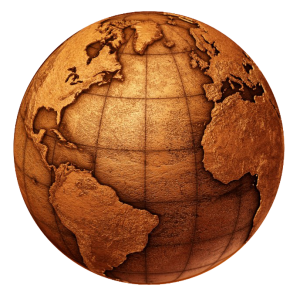 The Israelites did not succeed in driving out most of the population of these frontier lands. In what they thought to be a shrewd move the Israelites used these Canaanites as their labour force. Interesting that they made the same mistake as the Egyptians, albeit for different reasons. They used a large foreign force as their workforce and undoubtedly relied on them for a significant portion of their economy. The twelve tribes of Israel took most of the Promised Land but did not manage to cleanse it entirely from the inhabitants. Each one had their thorn in the flesh (2 Corinthians 12:7-10). The Benjamites, for instance, failed to oust the Jebusites and so remained cohabiting with them for centuries. (b) The enemy would make alliances against Israel with the Philistines and other adversaries and invaders. Eventually, when strengthened, Israel put the Canaanites to forced labour, but they never got rid of them. On a lighter note, in the south Othniel took Caleb’s daughter Acsah in marriage for having captured Kiriath Sepher. (b) intermarriage with pagan nations. These were the two main stumbling blocks that would cause the downfall of the Hebrew nation several times throughout the next millennium until its eventual final diaspora after Christ’s death and resurrection. Joshua had a healthy battle instinct. He knew when and where to attack, using the high ground to the best of his advantage. He did the best with what he had and did not shrink from a fight even when outnumbered or out-weaponed. This commitment is especially evident in his use of the terrain and ambushes when he found himself at a disadvantage. 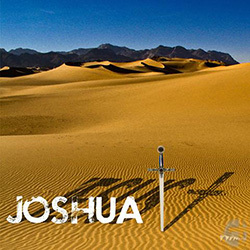 Although Joshua mostly relied on God for his success on the battlefield, he sometimes wavered or digressed from His provision. Nevertheless, he was quick to repent (as in Ai) and quickly got back on track. This attitude is what made him such a great example to the Christian. He may have faltered, but he was not proud, kept his heart pure and was sensitive to holy rebuke. a) Destroying the enemies of Israel. b) Occupying the Promised Land. c) Keeping unity in the nation. d) Distributing Promised Land to the twelve tribes of Israel. f) Designating cities if refuge for asylum. g) Establishing a new centralized headquarters. Joshua was buried at Timnath Heres in the hills of Ephraim north of Mount Gaash. It is culturally understandable that a people still considered to be nomads, the Hebrews, would look on to the Canaanite gods at superior. The Canaanites were a geographically established society. If the Israelite focus on their God were not kept to a healthy level, they would look to the natural. The things of the world are always the wrong source of inspiration or strength. The pattern we see in the next 500 years is that when the Israelite focus on their God is not kept to a healthy level, they weaken and go over to these other gods. It would work for a while but it was not sustainable, and soon Israel would find itself oppressed by poverty and outnumbered on the battlefield. While this may make sense in the natural, spiritually, when we do not walk on all that God has for us we may lose what we already have; this is never truer than in the Parable of the Talents (Matthew 25:14-30). Jesus tells of 3 workers to whom the master gave coins. Two of the workers invested the money and profited. The third worker buried the coin in fear of losing it. When the master discovered this, he admonished and punished the unfaithful servant. The two first workers risked losing it and gained more. The third worker thought that by not risking anything he would not lose anything, but he was not so; he ended up losing everything. The Israelites could have risked further loss in a final push to capture all of the Promised Land. Instead, they played it safe and “buried” their talent (their armies) to preserve it. God had repeatedly given His people everything: the world, a new start, deliverance, the Law, a new Promised Land. He expected them to use it. Matthew 25:29 For to all those who have, more will be given, and they will have an abundance; but from those who have nothing, even what they have will be taken away. In the initial period of the American Civil War, the new President Abraham Lincoln found himself under considerable pressure to end the war quickly; this he could only do by destroying the Confederacy’s will to fight. 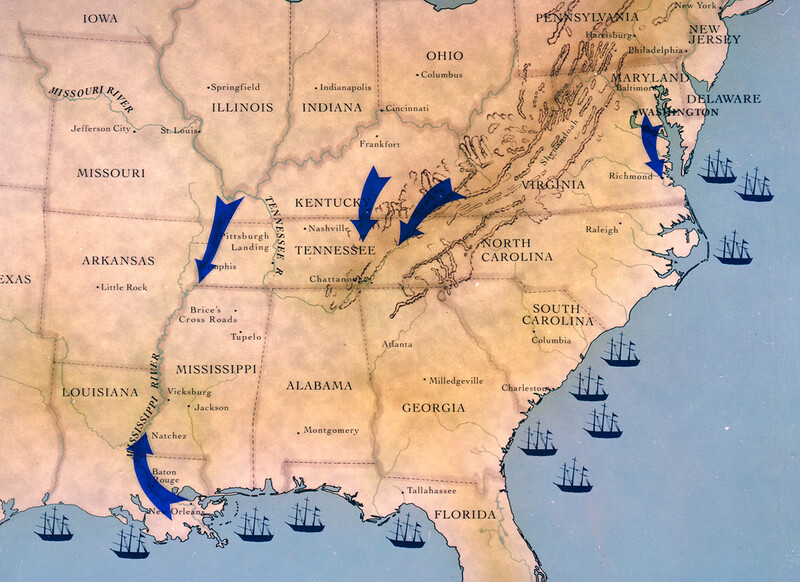 Invariably, this meant waging aggressive war towards the Southern States; most likely occupying key land areas therein. For the majority of the war, Lincoln was however blighted with a succession of commanders who refused to move against the enemy in a significant way. The commander in chief had decreed an offensive strategy but had to deal with army leaders that refused to attack. Winfield Scott, the most notorious of these, favoured the Anaconda Plan which was to win the war by slow economic constriction of the enemy rather than rapid advance. The complacency of the Union Army drove the nation to near defeat on a few occasions. Lincoln went through Scott, George McClellan and Henry W Halleck before Ulysses S Grant was able to exploit Robert E Lee’s disaster at Gettysburg and proceed, finally with the combative program commissioned by Lincoln. In our Christian walk, if we are in the same place spiritually that we were in last year, then we are backsliding. Disrespecting the message of prosperity mirrors this; it is religious (in the negative sense), limiting and so ungodly. Christians who have wrong teaching are prone to embrace a message of poverty or limitation. Some say that having wealth is evil. Others say that they have enough and don’t need more wealth; indeed not abundant wealth. Both are in error. For if God knows a Christian cannot handle wealth, He will not get it to him. God never said that money was the root of all evil; He said that the love of money is the root of all evil (1 Timothy 6:10; Hebrews 13:5). Being good stewards (1 Corinthians 4:2) is about managing what we have well; it does not imply that we are to have the minimum required for us. The passage alludes just as much to managing great wealth. We are to have wealth surpassing our needs because we should be blessing others with it. For us not to want wealth when we have the anointing to acquire it is to be supremely (albeit ignorantly) selfish. The Israelites were to secure all of the promised land to bless the entire world for all eternity. Canaan was to be taken by Israel so they could preserve the Promised Land as the birthplace of Jesus, the Messiah, the saviour of the world. We can see that as this practice continues, the cities become more challenging to conquer. They no longer fall as God had promised, but that was not because God had failed in His promise. It was because the people were disobedient. They were adding ingredients to God’s perfect recipe for victory and spoiling it. (c) He gave them a Promised Land of their own. (c) Destroy all traces of the enemy’s religion. 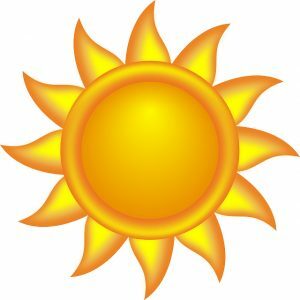 The work that was supposed to be light and easy (Matthew 11:30) and the blessing that should enrich without sorrow (Proverbs 10:22) no longer was because the people had ignored the conditions for it. You cannot serve two masters (Luke 16:13). This self-induced predicament shows that holiness, separation from evil, is required to walk right. We cannot have a covenant with God and with Satan simultaneously. The Israelites might not have known the implication of living together with the Canaanites, but if they had trusted and obeyed God, they would’ve been safe. Instead, the key nights would become a trap for them; God declared that much after the campaign. When you tolerate just a little bit of sin, it will come back and bite you. The Israelites would reap the consequence of their slackness in carrying out exact orders generations later but, for now, God in His mercy would ensure their military success against the next Canaanite battles. Joshua rebuked the people’s attitude. Joshua may have passed on his command to Caleb, but he was still the spiritual leader of the people. Joshua was not interested in taking Promised Land; he was interested in following God’s instructions and drive out the population of Canaan. Joshua understood one of the fundamental principles of war: that the ultimate objective of war is not to gain territory but to destroy the enemy. The Army of God had taken Promised Land and decided to be content with that without driving out the Canaanites. 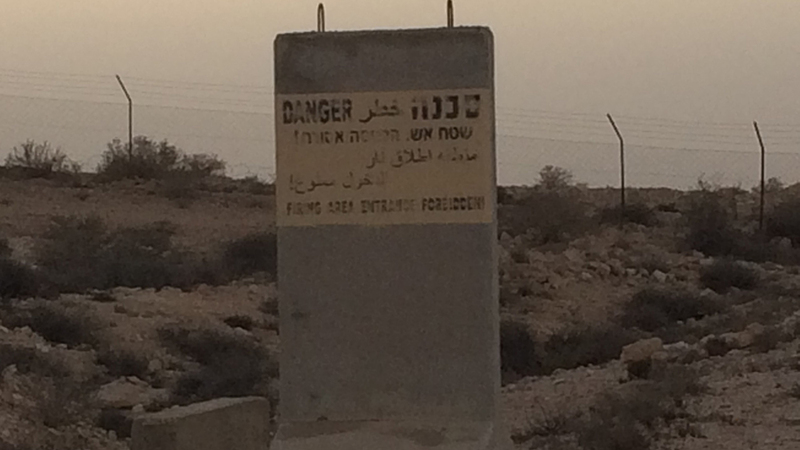 God did not promise the Hebrews a land with the threat of a pacified foe still within its borders. God promised a land free of danger, free of poverty, free of sorrow and toil (Proverbs 10:22). To accept anything less was not to accept God’s promised land but rather an earthly, man-made version of it. It was to trade in the perfection of God’s plan (777) for man’s imperfect version (666). With this behaviour, Joshua warned that God would remove His hedge of protection. The people compromised. They thought they could carry out their occupation relying on logical principles of the natural realm. They assumed that by avoiding further war, they would ensure peaceful coexistence; this was not so. Only God could keep them safe, and He could only do if they allowed Him. They would only allow Him to protect them if they followed His instructions. Every time the State Israel tried to keep the peace with the Palestinians by giving into concessions the results have not been peace. Re-Lighting a recent conflict has always followed a very brief period of feigned peace. Politically, historically and culturally, one can understand both sides, Arab and Jew. However, this does not change the fact that God assigned this land to His people and it was not for them to give it away. Whenever we depart from what God decrees we reap the consequences. Upon Joshua’s warning, the people quickly headed and repented. They occupied their allotted lands and kept their commitment to God for the remainder of Joshua’s life and his successors’. The Israelites did not take full consideration for the promise God had given them. Isaiah 53:3-4: He is despised and rejected of men; a man of sorrows, and acquain ted with grief: and we hid as it were our faces from him; he was despised, and we esteemed him not. Surely he hath borne our griefs, and carried our sorrows: yet we did esteem him stricken, smitten of God, and afflicted. Isaiah prophecies of the Messiah, Jesus. He points to the fact that some did not esteem, or appreciate fully, what Jesus did for them. Jesus suffered and died for us so that we would not have to (a) die spiritually nor (b) suffer in life. If we accept the first part but reject, disregard or minimize the second, then we are not taking the fullness that God has for us. God will have us saved into our spiritual promised land but also living with the blessings that go with it. The Israelites should not only take the land but take it entirely, with the full blessing. The law came by Moses, and yet he could not bring the people into the Promised Land. Joshua: Joshua brought the people into the physical Promised Land. Revelation: Jesus brought the people into the Kingdom of Heaven. 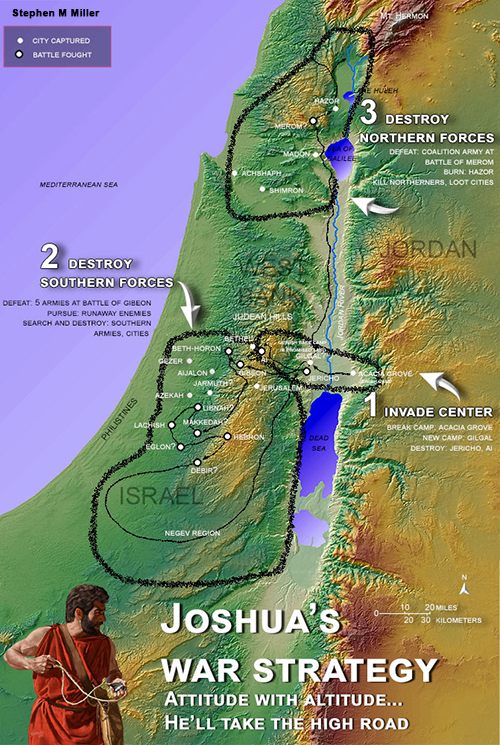 Joshua: Joshua took the Promised Land. Revelation: Jesus takes the whole Earth. 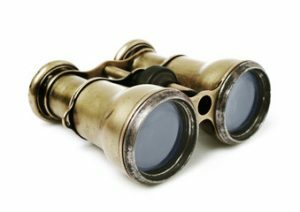 Joshua: Joshua was sent with two witnesses to spy out the Promised Land. Revelation: In Revelation 11 there are two witnesses. 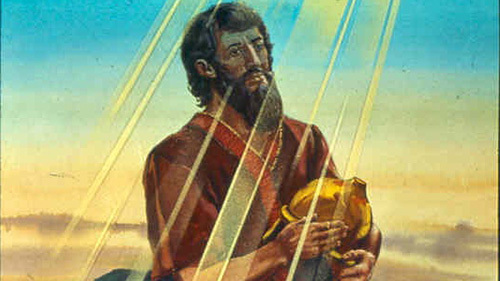 Joshua: 7 trumpets blowing for 7 days around Jericho. Joshua: alliance with false King Adoni-Zedek of Jerusalem is and forms a coalition against the Jews. 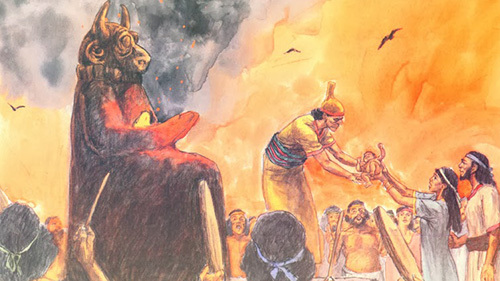 Revelation: Antichrist, seated in Jerusalem, persecuted the Christians. Hunger for God. He wanted to stay in God’s presence always. (Exodus 33:11). Exodus 33:11 The Lord would speak to Moses face to face, as one speaks to a friend. Then Moses would return to the camp, but his young aide Joshua son of Nun did not leave the tent. Protect and honour the man of God. Joshua honoured Moses unlike Miriam and Aaron (Numbers 12). Grabbing hold of past tense faith. That he had received victory and everything that came with it (Joshua 6:2). The Christian’s ushering in revival hinges on conforming to these principles. They all show a particular walk that believers who want more power, more revelation and more significant moves of God will do. Douglas MacArthur was one of America’s greatest commanders. During the Pacific War (1941-45) he successfully helps turn the tide and recaptured the Philippines thus sealing the fate of the Empire of Japan. In the Korean War (1950-53), MacArthur’s daring gamble in the Incheon landings rescued the UN coalition forces from the jaws of annihilation and sent the enemy reeling across to Manchuria. 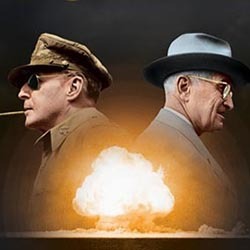 MacArthur’s military qualities were beyond reproach. However, he eventually surpassed his charter and meddled into political affairs directly challenging his leader, President Truman, and risking nuclear war with China. This affront led to his dismissal in a clear example that even MacArthur, a five star General of the Army was replaceable if his core values did not match his leader’s. Although Judges 1 already mentions Othniel as one of the army commanders in Judges 1. 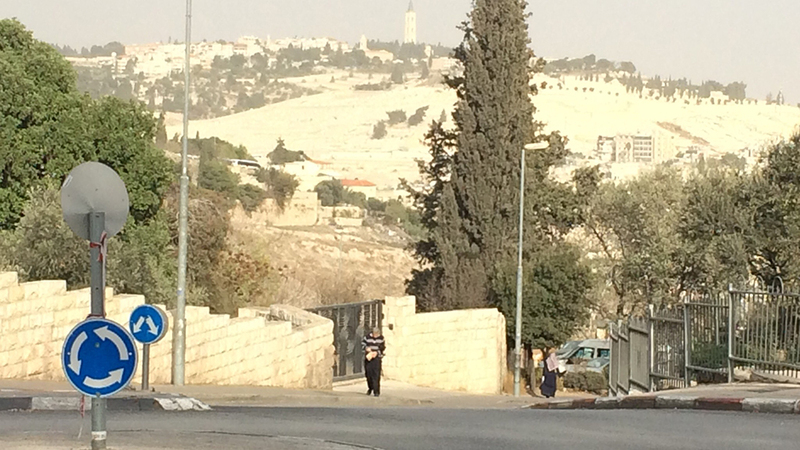 This is the same city where the Hebrews were defeated in Numbers 21. The name was changed at this junction in Judges 1 but must have previously been named Zephath. The name Hormah was probably used consistently in Scripture for historical simplification. In the hills of Ephraim north of Mount Gaash. 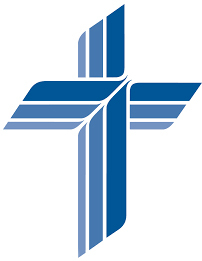 Craig Field, Promise of Life Church.